Scrub-N-Rub is a convenient soap filled pad, which has been masterfully impregnated with a gentle, hypo-allergenic cleaning solution for a wash, anywhere! 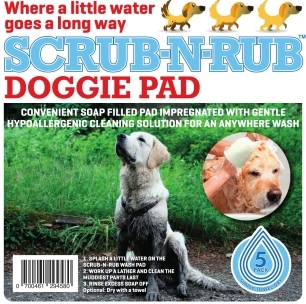 Doggie Scrub-N-Rub pads are a super convenient, soap filled, cleaning pad which is ideal after a mucky walk before getting into your car, or to prevent muddy paws all over the house! 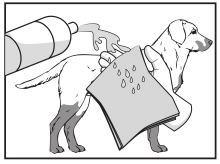 To use, simply splash a little bit of water onto the pad, which will lather up when applying to your muddy best friend (we advise using on the dirtiest parts of your furry friend first). To remove the suds, a dry towel should be more than sufficient! Alternatively, rinse with water. 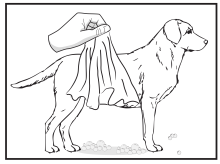 Apply a small volume of water to the Scrub-N-Rub Dog Pad. 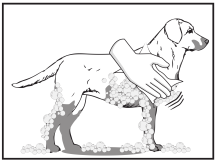 Begin to work up a lather on your dog friend by rubbing them after applying the water. The cleaning of suds can be done very easily by wiping down with a dry towel or using a splash of water. If you are still requiring more information about the Scrub-N-Rub Doggie Pad, then go to their website by clicking on the logo.